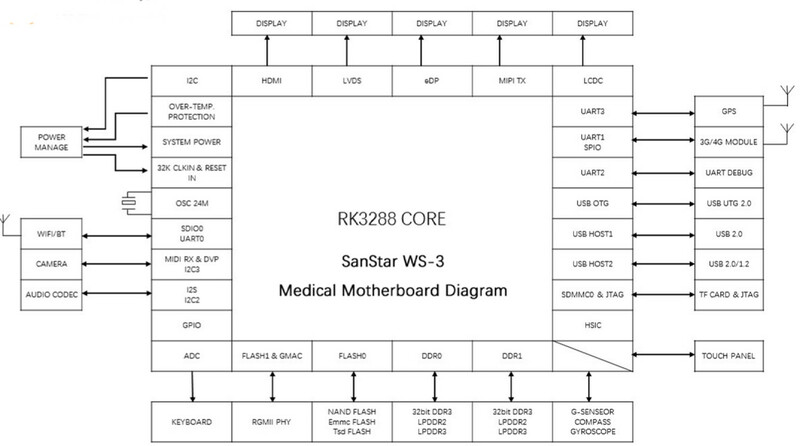 Warp United, a “Chinese Health 2.0″/point-of-Care medical technology company based in Shenzhen, launched Warp 3 medical recorder – an Android powered handheld device supporting various vital signs and ultrasound medical modules – earlier this year, and the company has now just introduced SanStar WS-3A motherboard powered by Rockchip RK3288 quad core Cortex-A17 SoC, and running Android 5.1 in order to allow engineers to develop and connect their own medical modules via the various interfaces of the board, and create their own medical products. Audio – audio input, output, MIC interfaces, HDMI out. The board runs Android 5.1, and support up to two independent screens, or one 4K screen. The best way to find out what’s possible with the board is to check out what the company has done with Warp 3 medical recorder system comprised of a 7″ RK3288 tablet communicating with Volans 3 Vital Sign Module to gather ECG, heart rate (HR), respiration (Resp) rate, temperature (Temp), SpO2, pulse rate (PR), and non-invasive blood pressure (NIBP), as well as various “Urxa 3” ultrasound modules. Software includes an interface to display all those metrics on the tablet, as well as support for cloud based mobile health (mHealth) and EMRs (electronic medical records). 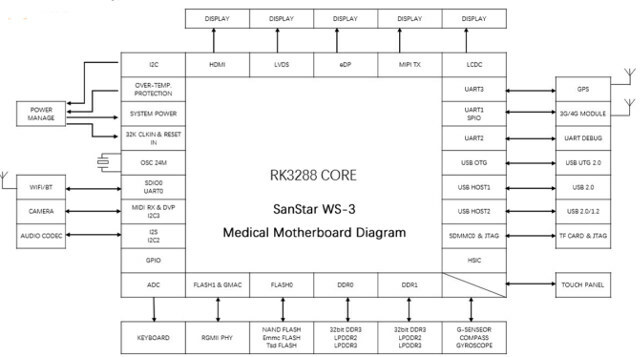 SanStar WS-3A single board computer is available now at an undisclosed price. Visit Warp United’s SanStar WS-3A product page for further details. @cnxsoft: ‘mini PCie interface’? That’s just USB2 utilizing pins 36/38 of the mPCIe connector, right? Yes. No PCIe in that processor.